The legendary Marcella Hazan passed away one year ago on September 29th. A few years ago, I not only became enamored with her teaching and her famous cookbook, the Essentials of Classical Italian Cooking, I became captivated by her story and her approach to Italian cooking, and wrote about it here, featuring the many dishes I have made from her teaching. This week I sat in Milan and had the opportunity to eat green lasagna, which answered the question for me as to how well I captured the recipe. Let me quickly answer your question first. What is green lasagna? Funny enough, it was a “green lasagna” google search in 2008 that led me a blog, which led me to founding Spinach Tiger. However, I had a different green lasagna in mind, and it would be a few years until I would discover what green lasagna is to a true Italian. 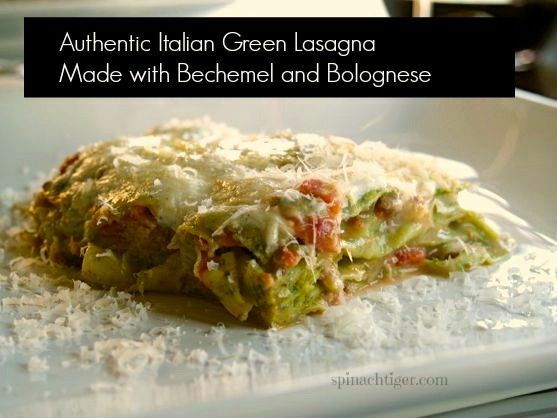 Green lasagna is made with green (spinach) noodles, and layered with bolognese and bechemel. It’s not a ricotta and spinach filling, as I once thought. The Italians reserve that mainly for ravioli and that can be found all over Northern Italy. The green lasagna was not so easy to come by, and sometime next week, I’ll show you what it looked like and how very similar it was to this dish. This is not the heavy lasagna we are all most familiar with. However, it is a very rich dish. Green Lasagna is a bit of process to make, but no more complicated than a good mac and cheese. The bolognese takes time to prepare. While bolognese is fairly easy to put together, it requires several hours to simmer. Bolognese is not a spaghetti sauce, in that it’s not a tomato sauce with meat, but it’s rather a meat sauce with some tomato, made gently soothing by the addition of white wine and milk. I encourage you to make a triple batch of bolognese because it freezes well and is quite suitable for a wide pasta such as a papparadelle, crepes, risotto, or even my American twist of the sloppy Joe, using a different Marcella bolognese recipe, with pancetta, sausage, beef and pork, which is probably my favorite. The first bolognese I tried is also very good but only uses one meat. You can make two pans of green lasagna and freeze one, which is another recommendation. The beauty of this dish is its balance and delicate flavor. Green lasagna is very rich and not meant to be eaten in a large portion, and remember there is always tomorrow. First, choose which bechemel sauce you want to use. For this dish, I would probably go with the all beef bolognese. (Link inside recipe). We would love for you to follow us on social media. The full European vacation posts will, of course, be here, so please subscribe and never miss a post. The first time I ever tried it was in Venice when I was 18.